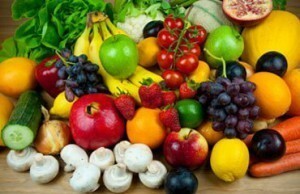 There is compelling evidence that a diet rich in fruits and vegetables can lower the risk of heart disease and stroke. The largest and longest study to date, done as part of the Harvard-based Nurses’ Health Study and Health Professionals Follow-up Study, included almost 110,000 men and women whose health and dietary habits were followed for 14 years. When researchers combined findings from the Harvard studies with several other long-term studies in the U.S. and Europe, and looked at coronary heart disease and stroke separately, they found a similar protective effect: Individuals who ate more than 5 servings of fruits and vegetables per had roughly a 20 percent lower risk of coronary heart disease (2) and stroke, (3) compared with individuals who ate less than 3 servings per day. The Dietary Approaches to Stop Hypertension (DASH) study (4) examined the effect on blood pressure of a diet that was rich in fruits, vegetables, and low-fat dairy products and that restricted the amount of saturated and total fat. The researchers found that people with high blood pressure who followed this diet reduced their systolic blood pressure (the upper number of a blood pressure reading) by about 11 mm Hg and their diastolic blood pressure (the lower number) by almost 6 mm Hg—as much as medications can achieve. In 2014 a meta-analysis of clinical trials and observational studies found that consumption of a vegetarian diet was associated with lower blood pressure (19). A more likely possibility is that some types of fruits and vegetables may protect against certain cancers. Taken as a whole, however, these studies suggest that increased consumption of tomato-based products (especially cooked tomato products) and other lycopene-containing foods may reduce the occurrence of prostate cancer. (6) Lycopene is one of several carotenoids (compounds that the body can turn into vitamin A) found in brightly colored fruits and vegetables, and research suggests that foods containing carotenoids may protect against lung, mouth, and throat cancer. (6) But more research is needed before we know the exact relationship between fruits and vegetables, carotenoids, and cancer. Some research looks specifically at whether individual fruits are associated with risk of type 2 diabetes. While there isn’t an abundance of research into this area yet, preliminary results are compelling. In a study of over 66,000 women in the Nurses’ Health Study, 85,104 women from the Nurses’ Health Study II, and 36,173 men from the Health Professionals Follow-up Study who were free of major chronic diseases, findings suggested that greater consumption of whole fruits – especially blueberries, grapes, and apples – is associated with a lower risk of type 2 diabetes.